Richard Boraman and Robert Hacken both attended Ash Vale School and were listed on the School Roll of Honour in 1915 as in the RMLI on HMS Hampshire. They had enlisted together in 1912 at Southampton, had both joined HMS Europa in December 1913 and HMS Hampshire in December 1914. Along with Charles Payne and Albert Lynn, they perished together on 5 June 1916, when HMS Hampshire was sunk by a mine off the Orkneys whilst taking Lord Kitchener to north Russia on a secret mission. The Surrey and Hants News of 22 June 1916 reported that Richard Boraman was the 4th son of Mr and Mrs C.J. Boraman of Bellevue, Firacre Road. His brother James Henry was also in the RMLI. Richard Boraman’s Service Record (TNA ADM/159/190) records that he was able to swim, and had a fresh complexion, hazel eyes and brown hair. He was 5 feet 5¼ inches tall when he enlisted, and he had been a plumber’s mate. Richard Boraman was born in Aldershot. The census records that his parents Charles and Clara Boraman lived at 2 Princes Terrace Aldershot in 1901 with six children, William, Charles, James, Richard, Edward and Lily. The family had moved to Ash Vale Farm in the Inner Quadrant by June 1905, when Edward and Lily were admitted to Ash Common School along with their sister Violet, and Richard and Charles were admitted to Ash Street National School. The 1911 census reveals that they had moved to Bellevue in Firacre Road, and that Richard was a greengrocer’s assistant. When he enlisted Richard gave his date of birth as 10 December 1894, but he was really born on 10 December 1896, and was only 15 years old. The Naval Medal and Award Rolls record that he had earned the 1945/15 Star. His medals were sent to his father. Robert Hacken was the son of Thomas and Mary Ann Hacken of 1 Pollard’s Cottages, Vale Road. The census records that in 1911 the family lived in 1 Riverdale Cottages in Vale Road and 15 year old Robert was an apprentice carpenter at the Army Balloon Factory. He had been born in Guernsey. The Surrey and Hants News 22 June 1916 reported that he was Mrs Hacken’s eldest son aged 19, and that he had been 6 foot 3 inches tall and devoted to his widowed mother. Mrs Hacken’s other son (Thomas) was 15 and was in the band of the Royal Fusiliers. Robert Hacken’s Service Record (TNA ADM/159/190) records that he could swim and was 5 feet 8¾ inches tall when he enlisted, with a fresh complexion, and brown eyes and hair, and that he had a scar on the left side of his head and neck. It gives his mother’s address as 2 Hope Town Villas. He had been a carpenter’s mate. When he enlisted Robert gave his date of birth as 5 December 1894, but he was really younger than that. The Naval Medal and Award Rolls record that he had earned the 1914/15 Star. His medals were sent to his mother. Albert Lynn was baptised at St Mary’s Church 19 August 1896, the son of George Henry and Alice Mary Lynn. The censuses record that in 1901 his father was a hairdresser (born in Canada) and his mother was a laundress, and the family lived in Vale Road. In 1911 the family lived in Firacre Road, and his mother had remarried and become Mrs Swift. Albert Lynn’s Service Record (TNA ADM/159/189) records that he enlisted 28 November 1911, with Charles Read. He was 5 feet 7 inches tall with a fresh complexion, grey eyes and brown hair. He had been a garden boy and he had a scar on his left knee. He served on HMS Ariadne, HMS Europa and HMS Hampshire. The Naval Medal and Award Rolls record that he had earned the 1914/15 Star. His medals were sent to his mother. The Surrey and Hants News 22 June 1916 reported that Charles Payne was the son of Mr and Mrs Henry Payne of 1 Lily Cottages, Shawfields Road. He had been previously employed by the Aldershot Gas and Water Company, and was devoted to his mother. It was news she could hardly bear. She had also just heard that her other son Cpl Henry Albert Payne 10th Hampshire Regiment was now a cripple for life having lost both his hands. He had fought in the Dardanelles, and was a 32 year old man with 6 children. He lived in Portsmouth where he had been in the Gosport Fire Brigade. 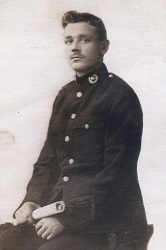 Another son, Bert Ernest Payne, had been wounded at Ypres.